1960 SC-1 - Communication Plaza | Yamaha Motor Co., Ltd. The SC-1 was Yamaha Motor's first scooter model. It employed many advanced technologies at the time like an electric starter/dynamo, a transmission that combined the torque converter and transmission with two gears, a shaft-drive type drivetrain and single-sided suspensions for the front and rear wheels. 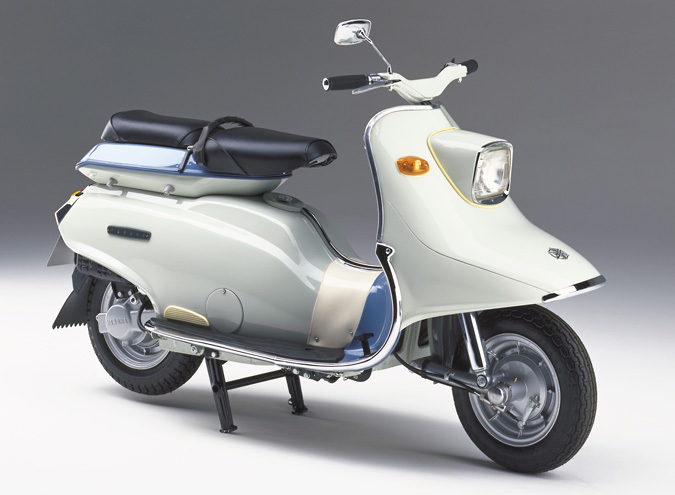 With the Japanese scooter market seeing rapid expansion as domestic and overseas makers entered the scene, the SC-1's excellent running performance and avante-garde design excited the era's fans. *All figures, etc. in a model's description or specifications are from when the model was originally released.